In the Wishing World, dreams are real. You can transform into your own hero, find wild and whimsical friends, and wield power as great as your imagination. But Lorelei doesn't know about any of that. All she knows is that a monster took her family. It happened during a camping trip one year ago. Hiding inside the tent, she saw shadows, tentacles and a strange creature. By the time she got up the courage to crawl outside, the monster--and Lorelei's mom, dad, and brother--were gone. Lorelei is determined to find her family. 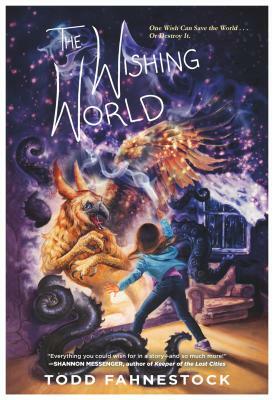 When she accidentally breaks into the Wishing World, she discovers a way. It's a land more wonderful than she could have imagined, a land of talking griffons, water princesses, and cities made of sand, where Lorelei is a Doolivanti--a wish-maker--who can write her dreams into existence. There's only one problem: the monster is a Doolivanti, too. What he wishes also comes true, and he's determined to shove Lorelei out, keep her family, and make the whole Wishing World his. To save them, Lorelei must find the courage to face him, or her next wish may be her last. Award-winning author Todd Fahnestock makes his middle grade debut in this charming and whimsical adventure!